CHORAL MUSIC has, from the formative years of Trinity church to the Ayr St. Columba of today, provided a greatly valued contribution to worship. It is appropriate here to recall with appreciation the distinguished tenures of both Elizabeth C. MacIntyre ARCM, Organist and Choir Leader form 1920 to 1955, and Leslie R. Thornton BA, FTCL, Organist and Director of Music from 1960 until 1998. 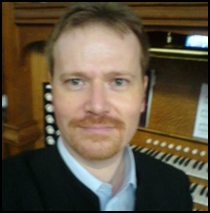 Matthew Hynes BA(Hons), the present Organist and Choir Master at St. Columba, took up the position in February, 2007. He is a graduate of the Royal Scottish Academy of Music and Drama, where he studied organ with Dr. George McPhee. Our choir presently comprises over twenty enthusiastic voices, yet, in common with many another church, the need to recruit new members, especially men, remains an ever-present one. Regular practices take place on Thursday evenings at 7.30pm, from the start of September until the end of May. Additionally, the choir meets throughout the year on a Sunday morning, at 10.55am, for a short rehearsal prior to the 11.15 service. Anyone considering augmenting our existing voices is warmly encouraged to speak to either Matthew or any member of the choir. A friendly welcome at our rehearsals is assured. THE ORGAN, comprising three manuals, twenty-six stops, was built in 1903 by James J. Binns of Bramley, Leeds. 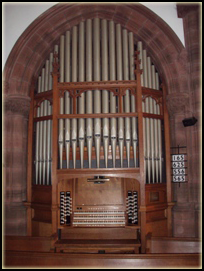 The instrument was installed into two specially-provided chambers on either side of the chancel and, upon completion, an Opening Recital was given on 26th January, 1904, by the celebrated blind organist, Alfred Hollins, of St. George’s U.F. Church, Edinburgh. The renowned Binns firm later provided several substantial and impressive instruments throughout Ayrshire, many of which continue to give good service. An extensive scheme of work was undertaken in 1962 by the J. J. Binns Organ Building Company of Leeds (a company set up in 1954 which had acquired the Binns name and premises). In addition to the conversion of the original tubular-pneumatic key mechanisms to an electro-pneumatic system, the tonal scheme of the instrument was amended and augmented in a style in keeping with the wisdom of the time. By the early 1980’s, however, it became clear that a “root and branch” re-build could not be delayed indefinitely if the organ was to function reliably into the 21st century, and on the advice of Leslie Thornton, the then Organist and Director of Music, Messrs Harrison & Harrison of Durham were entrusted with this work in 1984. The main objective of the work was, naturally, to secure the future reliability of the instrument, and to this end the key actions were re-built, solid state technology being introduced for the coupling and piston actions. A new seven stop slider soundboard was built for the Choir Organ, to accommodate the three stops which had been added, on direct electric windchests, in 1962. All of the pipework was restored, a number of stops being modified to improve their effectiveness, and a new Mixture stop provided to the Great Organ. The console, too, was new. The Harrison & Harrison estimate for the 1984 work recommended several items which were not carried out at that time. However, a subsequent generous bequest from the late Miss Isobel Wilkie enabled the majority of these items to be addressed by the Durham firm in the autumn of 2005. The main aspect of this work involved the re-ordering of the console side of the organ to improve the tonal egress of the Great and Swell departments into the building. The Great Organ soundboard was lowered by almost three feet, into the space previously occupied by the bulky tubular-pneumatic key transmission. The Swell department, formerly suppressed behind the Great, received a new expression shutter front. The wind distribution system was re-designed, the two bellows for the Swell and Great departments being completely re-leathered. Some of the tonal changes proposed in 1984 were implemented in the Pedal and Choir departments, most noticeably with the addition of an 8-foot Festival Trumpet stop, a fitting memorial to the musical ministry of the late Leslie R. Thornton. The organ now comprises thirty-eight speaking stops. 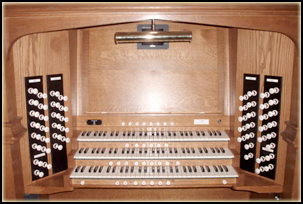 For all the technical details, visit our organ specifications page.